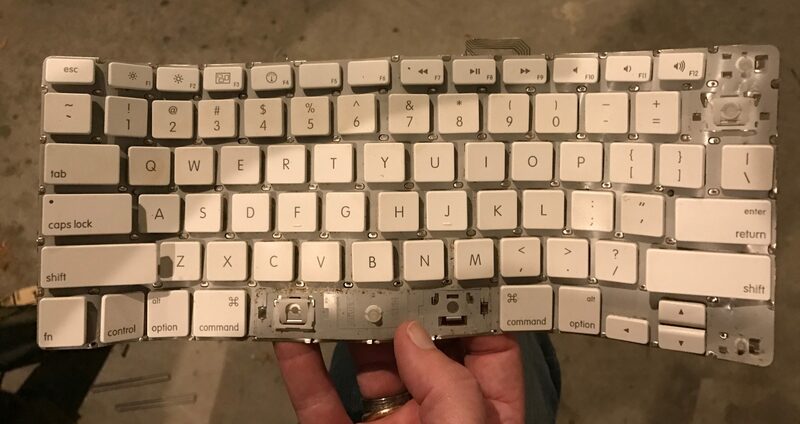 I noticed the other day that I had accumulated quite a few broken Apple wireless keyboards. 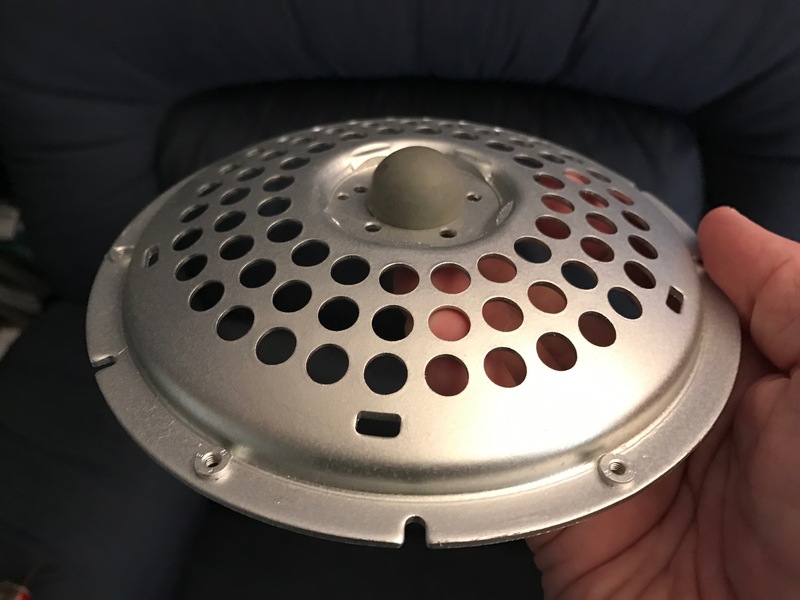 I removed all the electronics from them and turned them into a pretty cool looking lamp. Look below for the detailed instructions. 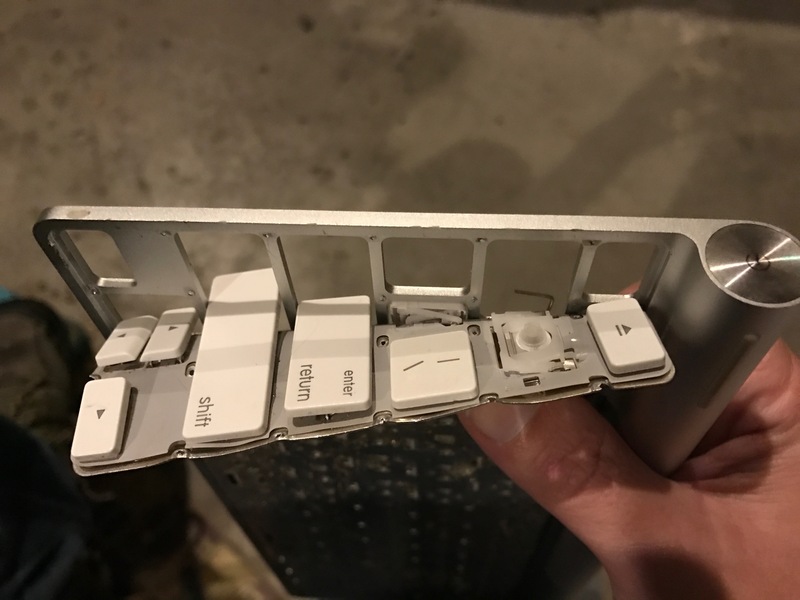 First, get ahold of 4 broken (or working and willing to be sacrificed) Apple wireless keyboards, and remove the batteries. I used the smaller model, only because I had so many of them. 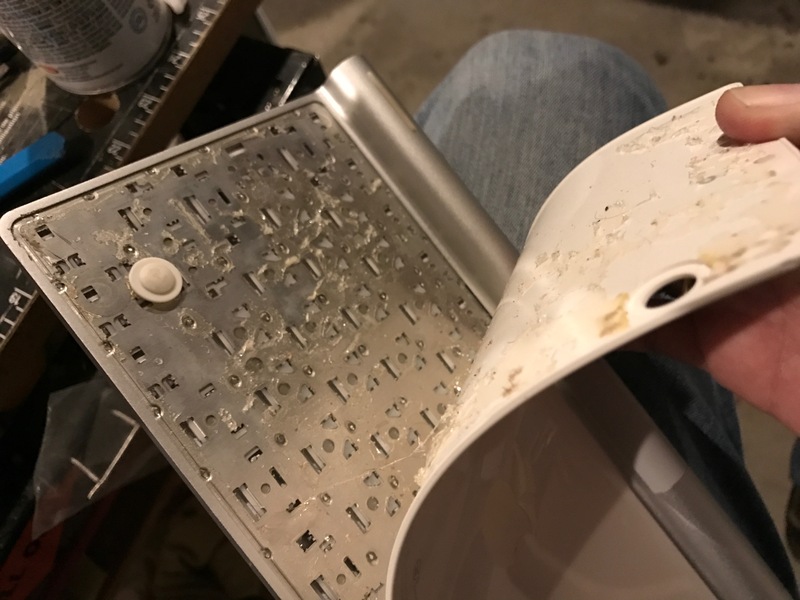 I’d love to make a lamp out of the extended keyboard, but I only have one broken one so far. 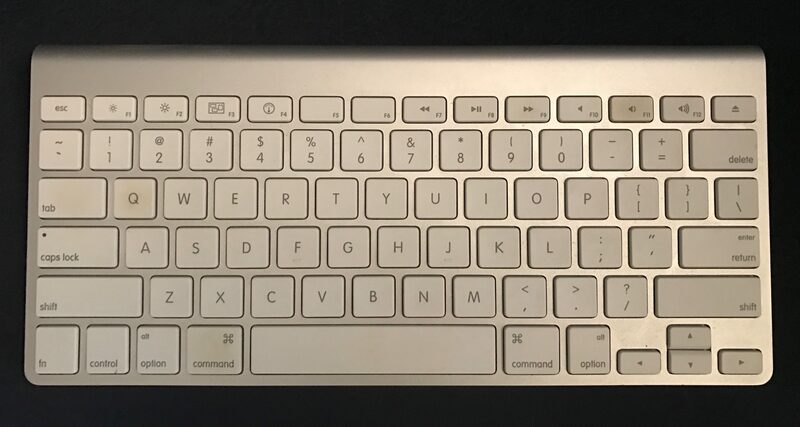 Start by turning the keyboard over and stick a small regular screwdriver in the corner of the keyboard like in the picture below. Slowly start peeling back the white plastic piece, while being very careful to keep the silver aluminum piece straight. 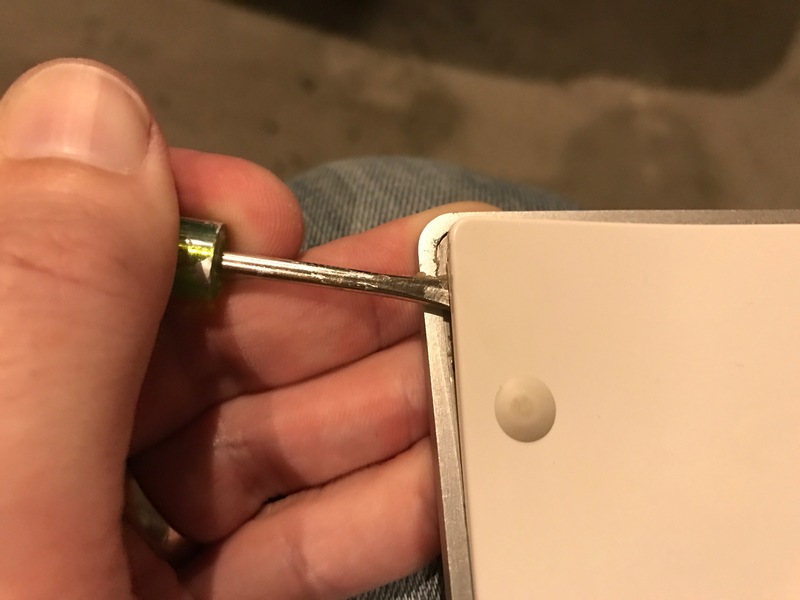 You don’t want the silver part to bend, only the plastic piece with the Apple logo on it. If you are having a hard time, use a hair dryer on hot as you peel the plastic piece back. 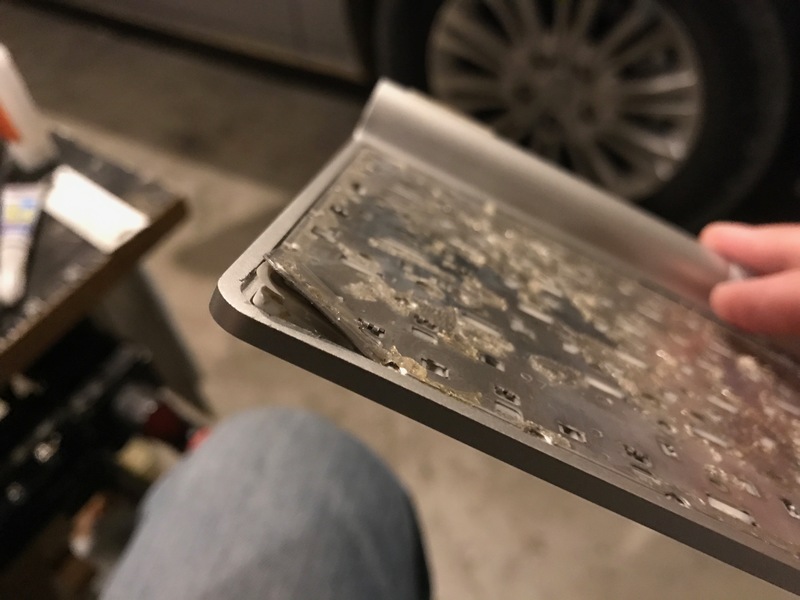 The hair dryer heats up the adhesive and makes it much easier to remove. Once the white plastic piece is removed, start removing the silver part that holds the keys. The keys come off easily with a little tug, be sure and save them. You can add magnets to them and spell stuff on a refrigerator, or spell out your name, or many other crafts. 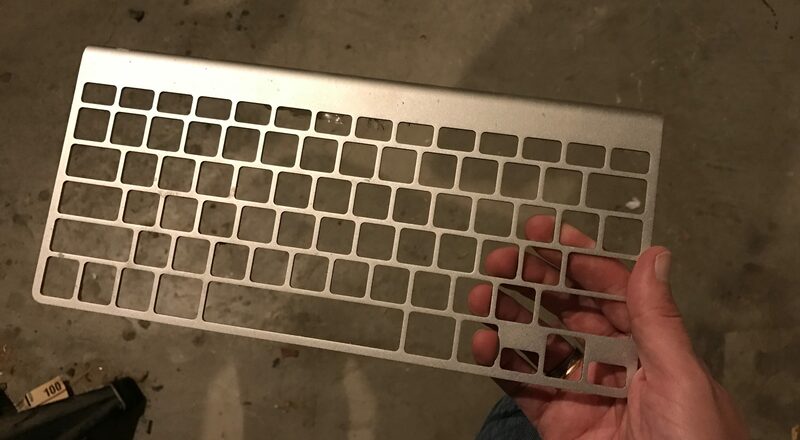 Now you should have just the silver aluminum keyboard frame. 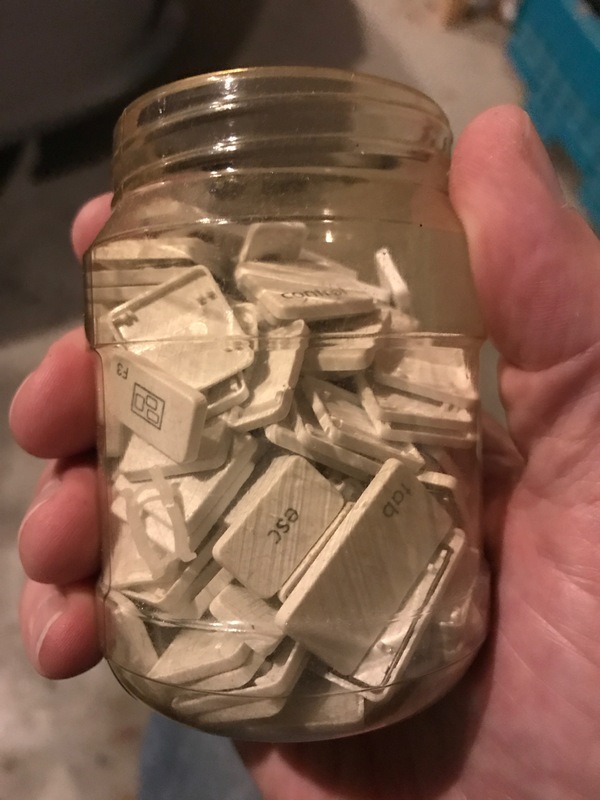 I used some pieces of plastic film that I had from taking apart lcd monitors and glued them to each of the keyboard pieces. 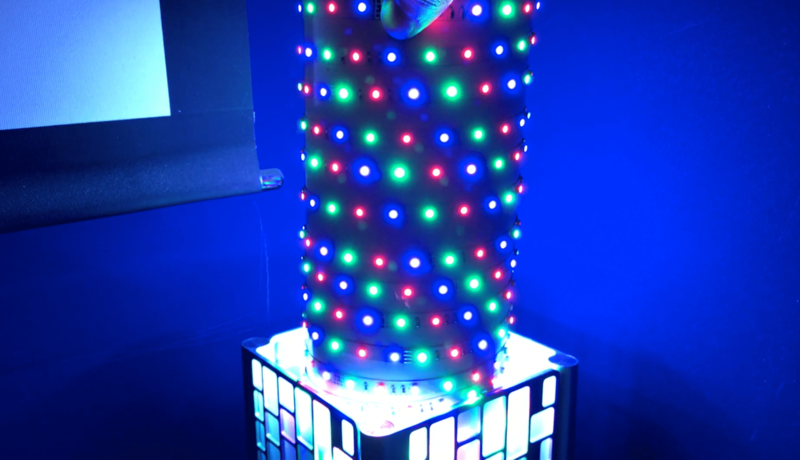 This gives the lamp a cloudy, fuzzy look, so the LED lights cause a glow from within. 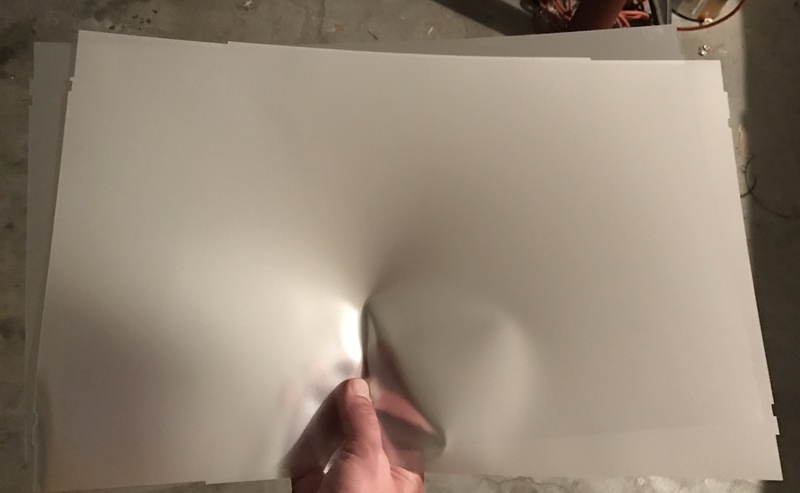 You can use any type of plastic sheeting you can find, or even just use cellophane or cloudy paper. I took 4 of these frames, and glued them together and then to a small piece of wood to hold them steady. I drilled a small hole in this base so the wire from the led lights can fit through. Next I cut a big piece of PVC tubing to fit inside the square structure. The lights I used are a long LED strip of colored lights controlled by a remote. You can find these extremely cheaply online; look at amazon.com, IKEA.com or banggood.com. 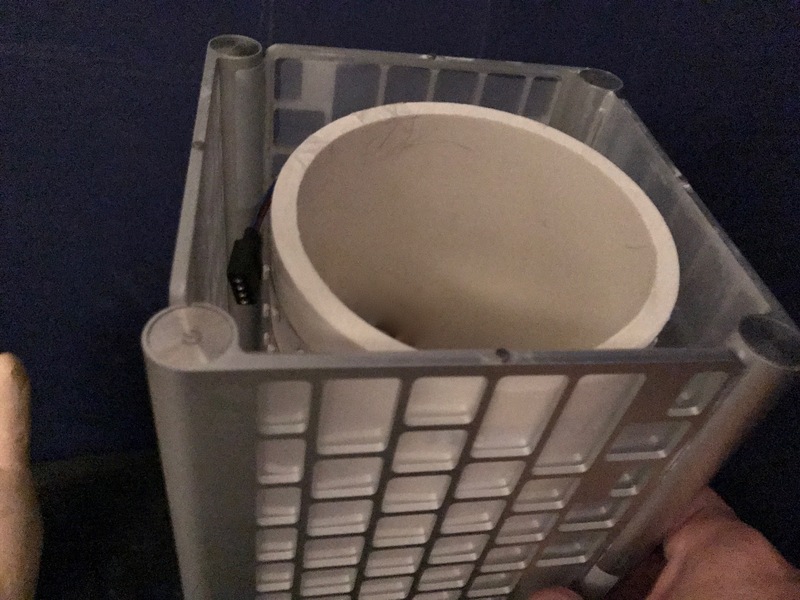 Take the light strip and attach it to the base of the PVC tube, and circle around the tube until you reach the top, covering the PVC evenly all the way up. For the top cover, I used a cool piece that I found in an old half-sphere iMac. I put a few tiny magnets on the top of the lamp to hold this piece still. It gives a really neat shadow on the ceiling. And that’s basically all there is to it! 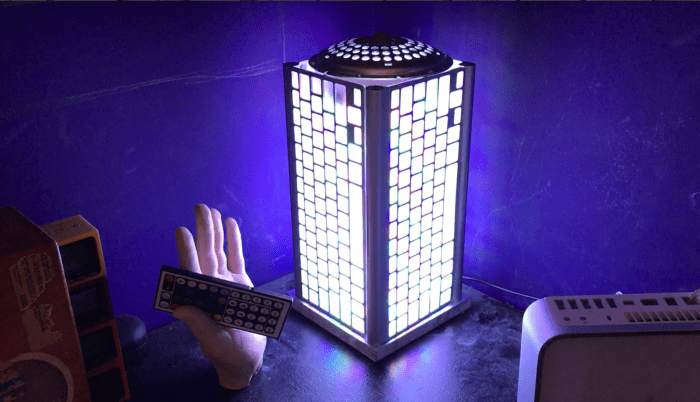 Click below for a quick video showing the lamp in action. 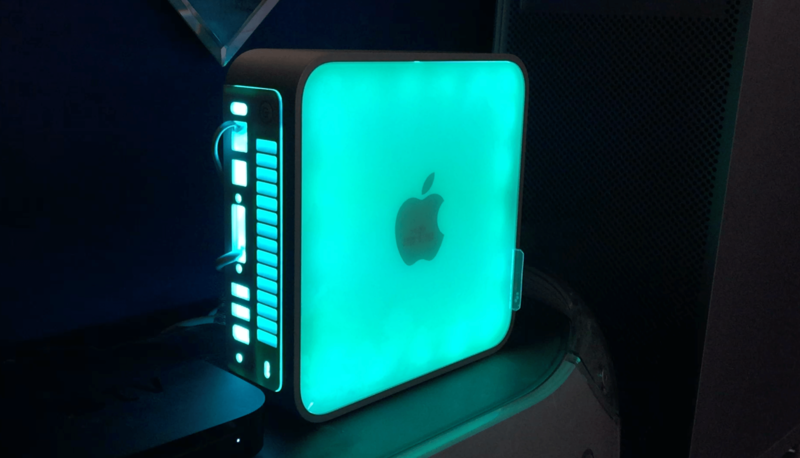 I’ve turned some other old macs into lamps as well, such as an original Mac Mini below. It needs no instructions however, just hollow the thing out, and add some lighting. This entry was posted on Thursday, October 20th, 2016 at 5:56 pm	and is filed under Uncategorized. You can follow any responses to this entry through the RSS 2.0 feed. You can leave a response, or trackback from your own site.